Compensation and professional challenges are key pieces to solving the biopharma employee satisfaction puzzle. The biopharma industry has found itself under political and societal microscopes in recent years, as executives search for answers to criticisms about high drug prices, shortages of vital therapies, and the industry’s role in the opioid epidemic. Meanwhile, a record number of new drug approvals and the emergence of innovative therapies demonstrate the potential of bio/pharma R&D efforts. Bio/pharma development and manufacturing functions rely on skilled and knowledgeable workers. Hiring and retaining this expertise should be a top priority. With the US unemployment rate at record lows, the career opportunities for US-based bio/pharma employees should be promising. Insight provided by respondents to BioPharm International’s annual employment survey (1) suggests that employee satisfaction is tied not just to compensation, but also to the challenges presented by the work and the employer’s potential for success. In one indicator, salary ranked only seventh on a list of 12 factors contributing to job satisfaction. Intellectual stimulation and challenging projects were the leading “main reasons I come to work,” followed by a good work/life balance, the company’s potential for success, job security, and good benefits. Nearly 75% of the respondents, however, said insufficient budgets and resources to accomplish a task contributed to job dissatisfaction. Nearly 70% said issues with management, timelines that are too short, and uncertainty about the company’s performance contributed to job dissatisfaction. Graphics: Dan WardThe annual survey, fielded in November and December 2018, represents more than 250 responses from the United States (72.2%), Europe (18.9%), Asia and India (10.4%), and other regions. Respondents predominantly were full-time, permanent employees (80.1% of respondents) at innovator biopharmaceutical companies (29.4%), generic-drug manufacturing companies (8.6%), academic institutions (10.2%), and contract research and manufacturing organizations (12.2%). The respondents represented companies that develop or manufacture large-molecule drugs, vaccines, and cell therapies or gene therapies; more than half reported that their companies are also involved in small-molecule drug development. Respondents in the biologics sector work for companies of all sizes. Almost 36% of the respondents work for companies with more than 5000 employees; more than 46% work for companies with fewer than 500 employees. The respondents were evenly split in tenure in the biopharma industry; 28.6% had fewer than 10 years of experience, 26.9% had 10–20 years, 34.8% had 20–35 years of experience; almost 10% of the respondents have worked in the industry for more than 35 years. 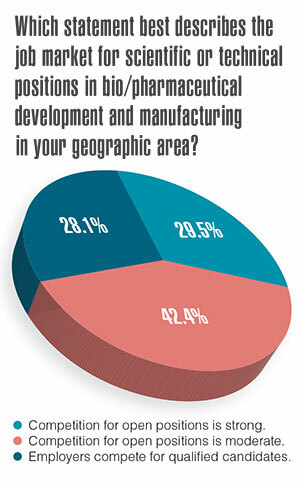 About one-half of the respondents worked outside the bio/pharma industry for more than five years. Fewer than half of the respondents held doctorate-level degrees or higher (43.8%). More than half of the respondents (54.8%) indicated that they were individual contributors versus managers of people. Respondents to the 2018 survey reported slightly more job mobility than in previous surveys. More than 40% stayed with the same employer, on average, for less than five years. Fewer than one-third stayed for 11 or more years. Click to view PDF. Graphics: Dan WardAs reported in previous surveys (2), respondents said the volume of work continued to increase year over year. Almost 38% said they used less than half of their allotted vacation, sick, or personal time. 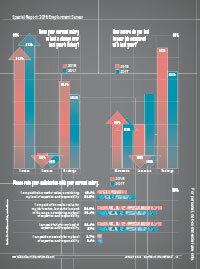 Fewer than 20% said they used all available paid time off. However, the number of people reporting salary increases in 2018 (54.8%) dropped compared with 2017 (61.1%). More respondents reported no change in salary in 2018 (39.4%) compared with 2017 (33.3%). Nearly 58% of the respondents said they were paid at the low end of the range for their job function, or below market value; a slight improvement over the 60% who reported the same ranges in 2017. While employers may offer benefits and perks to retain employees, survey respondents noted little or no positive changes in benefits offered. Almost 43% said there were no notable changes. Only 6% reported an increase in company pension or 401K contributions; fewer than 4% said profit sharing increased. Health insurance costs were a pain point; 40% said costs for insurance increased and almost 17% said the coverage was reduced. Overall, respondents were more optimistic about job security. Only 19.8% said they felt less secure in their positions in 2018, compared with one-third of the 2017 respondents. The percentage of people who said there was “no change” in their job security year over year increased from 43.8% in 2017 to 54.5% in 2018; however, there is no indication if this “no change” represents a secure or insecure feeling. 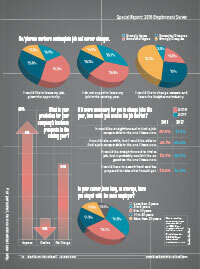 Graphics: Dan WardSurvey respondents were divided on the level of competition for available positions. A similar number of respondents said competition for open positions was strong (29.5%) or employers must compete for qualified candidates (28.1%). The shortage of qualified candidates may be easing: In 2017, more than one-third of the respondents noted that there was a shortage of qualified candidates; one-quarter said there were more qualified candidates than positions. However, individuals entering new biopharma positions may not be prepared for the requirements of the job; fewer than 7% of the respondents said new hires were extremely well trained. Nearly 60% said they would like to leave their job, given the opportunity; however, two-thirds do not expect to leave in the coming year. More than one-quarter said they would like to leave the bio/pharma industry, a concern for bio/pharma companies worried about employee retention. Salary was the most cited single reason to spur a job change, followed by work-life balance, professional advancement, and intellectual challenge. Most respondents were confident they would be able to secure a job comparable to the one they currently hold; 27% said it would be straightforward to find a new position; 46.1% were confident in finding a new position but said it would take a while to locate such a position. More than three-quarters of the respondents said their employer provides adequate training for basic skills. However, fewer (62.2%) said the company offers advanced training. Biopharma company employees were more optimistic about business prospects than their counterparts in the pharma sectors (3). More than 17% of respondents from around the world queried in the Pharmaceutical Technologyemployment survey predicted a decline in pharma business; 22.6% foresee a drop for Europe-based companies. In comparison, fewer than 10% of respondents working in biopharma—those responding to the BioPharm International survey—anticipate a decline in business in 2019. 1. 2018 BioPharm International Employment Survey, BioPharm International, 2018. 2. 2017 BioPharm International Employment Survey, BioPharm International, 2017. 3. 2018 Pharmaceutical Technology/Pharmaceutical Technology Europe Employment Survey, Pharmaceutical Technology, 2018.